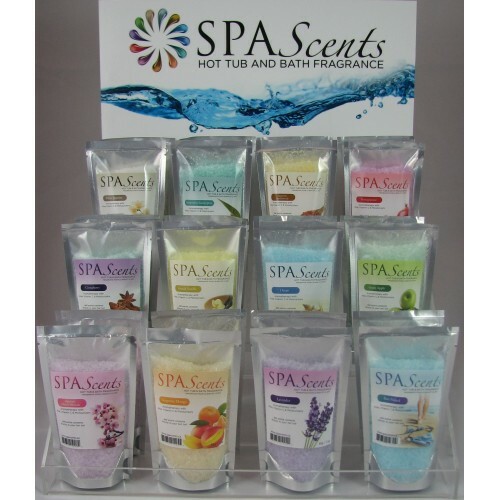 JUST ARRIVED in 2019...We are excited to be able to offer our customers SpaScents – Hot tub & Bath Tub Fragrance. Treat yourself or add one or more to a Spa type Gift Basket or Gift Bag. Made in Canada ~ Safe for Spas, Hot Tubs, & Baths ~ Oil Free ~ Will not clog filters or jets or effect water chemistry. 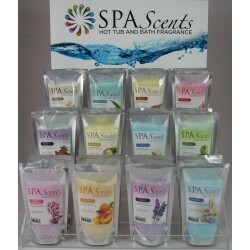 SpaScents Crystals stimulate your senses with hot tub and bath sample pouches. Allow the fresh scent of an ocean breeze wash over you, rejuvenate your mind and body with Spearmint Eucalyptus. Relax and unwind with the soothing scents of Lavender. Single use sample pouch. Hot tub and bath aromas will relax and rejuvenate your mind and body while the therapeutic elements pamper your skin with moisturizers.